This must be one of the most original ways to eat an appetizer. 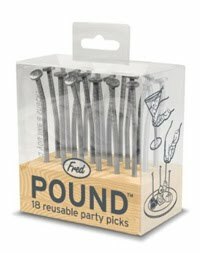 Spijker Cocktail Prikkers (Nail Cocktail Picks) will make a great conversation starter when people start to wonder if you are really serving them food stuck on nails. The picks come in a holder that looks like a piece of wood but is made of rubber. 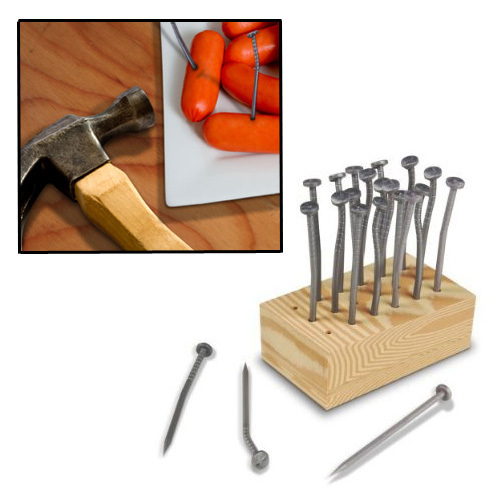 In the holder there are 18 picks that look like real wood nails but are made of hard plastic. These picks are reusable and should be washed by hand to keep them in the best condition. You can order them for your next party at MegaGadgets (multiple languages). Previous Previous post: Pizza… made of CHOCOLATE?!? !